In 2018 global sports entertainment leader Nitro Circus launched its all new You Got This show, performing in some of the world's most famous arenas, and wowed crowds all across the globe. Now the crew is ready to take 2019 by storm by bringing the adrenaline charged You Got This to outdoor venues across the United States for the first time, including McCoy Stadium, this May. Disclaimer: The stunts performed in Nitro Circus Live are amongst the most dangerous in the world. When athletes are attempting insane stunts 40 feet in the air over a 75 foot gap, the weather conditions have to be perfect as the onset of rain, dew, wind or other factors could be fatal. That's why we are reserving one or more additional days as a possible alternative show date in case we need to reschedule. When you buy your ticket, please check our website or ask your seller for the dates of the reserve days for the show you are interested in and, when you buy, make sure that you are available on the reserve days too in case we have to use them for a rescheduled show. If we do, there are no refunds. For Nitro Circus' full terms and conditions and our refund policy, please click here or go to NitroCircus.com or ask your seller for a copy. The refund policy is also printed on the ticket. By proceeding with the purchase, you are agreeing to Nitro Circus' terms and conditions including the reserve day policy. Thanks for reading and enjoy the most spectacular show you'll ever witness! Nitro Circus: You Got This is coming to Pawtucket on Saturday, May 25. The excitement begins at 7 pm at McCoy Stadium. Tickets go on sale to the general public Friday, February 15 at 10 AM, with tickets starting at $29* (plus applicable service charges). To purchase tickets go to pawsox.com or NitroCircus.com. Fans can also call the PawSox at (401) 724-7300 or visit the McCoy Stadium Box Office anytime during normal business hours. You Got This features a star-studded cast of top tier international athletes who hold over 45 X Games medals combined, including FMX riders such as 12-time X Games medalist Jarryd McNeil, 19-time X Games medalist Nate Adams, and 8-time X Games medalist Mike Mason; multi-sport sensations such as Ryan "R-Willy" Williams, and BMX stars such as X Games medalist Kurtis Downs, accomplished female FMX athlete Vicki Golden will be making her first full tour debut with Nitro Circus and is looking forward to giving the boys a run for their money. With no roof there are no limits. This huge stage set features the Giganta ramp, now with its biggest takeoff yet, that launches riders five stories into the air while the FMX riders will be flying 75 feet through the air from take-off to landing. The contraptions team is in the lab cooking up crazy new monstrosities for Nitro's daredevils to attempt to jump through the air. Click here for a taste. You Got This is the show you cannot miss. For more Nitro Circus news, including You Got This tour updates, exclusive behind-the-scenes content and more, go to NitroCircus.com and follow Nitro Circus on Instagram and Facebook. 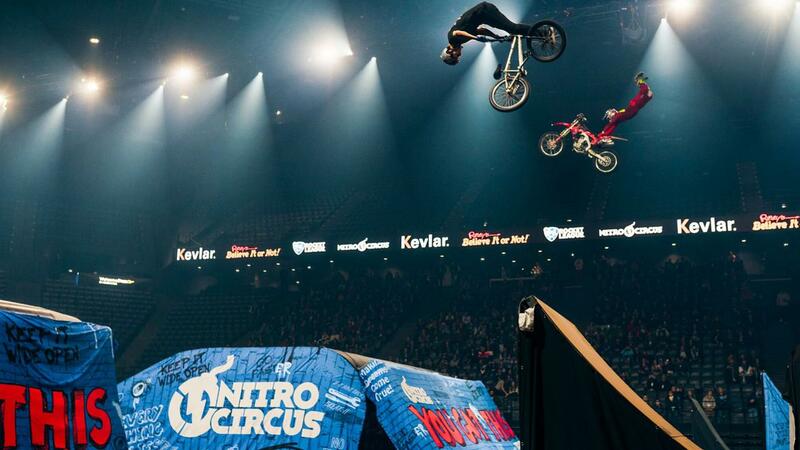 Nitro Circus' Renowned "You Got This Tour" to Hit Pawtucket, RI for First Time This Spring This story was not subject to the approval of the National Association of Professional Baseball Leagues or its clubs.